Wandering a botanical garden such as the Huntington, one cannot but give thanks to rich industrialists for their interest in botany, whatever their sins. We can only hope the likes of Mark Zuckerberg, Bill Gates, or George Soros will follow in their footsteps. Thanks to Henry Huntington, I finally made the proper acquaintance of this tree, Taxodium mucronatum, the Montezuma Cypress. I snapped the photo last Saturday as an afterthought, mainly to remember its placement next to the Temple of Love. I’ve never found a name tag for this giant, a tree I’ve walked by at the garden many times, and Saturday I overheard the familiar murmuring by those sitting near it or walking its enormous perimeter: “What is it? Do you know its name?” I can and do walk by many trees destined to forever remain anonymous, but any tree that can induce a physical reaction similar to being punched in the stomach deserves to have its name acknowledged. Maybe I’d bump into a docent later on in the day. For me botanical gardens are increasingly a setting to see trees allowed to unfurl in height and width to their full potential. When such conditions are granted, trees present a face that is both familiar and other. If street trees are tabbies, botanical gardens house the tigers of the arboreal world. This cypress hadn’t been limbed up at all, branches sweeping down to the lawn, ferny dissected leaves within strokable reach. The Huntington’s excellent bookstore would probably offer a clue, but we didn’t stop there this time, and I never found a docent to ask. And I was sure a quick search on the Internet would quickly churn up a name. This magnificent specimen had to be world famous. My first guess was metasequoia, but never having met one before I needed confirmation. I started search strings like “metasequoia near Temple of Love.” Nothing. And the images for metasequoia just didn’t fit. “Giant tree Huntington Botanical Temple of Love.” Endless search string variations were tried, all dead ends. I’ve become spoiled, accustomed to having any fact at my keyboard, and being stymied was an exasperating surprise. I did learn that the Temple of Love is of French origin (18th century, Louis XVI period, attributed to Louis Simon Boizot, purchase price $7,824), that Huntington’s railroad fortune included establishing Los Angeles’ first public transportation system, the Red Car, which my great-aunts have such fond memories of, dismantled after WWII to make way for automobiles and freeways (See Who Framed Roger Rabbit? ), but no identity for the tree. It was unthinkable that such a patrician of a tree would go nameless. My head cold made me pretty much unfit for anything else, so I kept up with the search off and on all day yesterday until the name Taxodium mucronatum surfaced, mentioned in a description of the rose garden, which is just adjacent to this tree and the temple. A quick image search confirmed that this might be the answer. Coincidentally, I’d been enjoying reading about the native bald cypress, Taxodium distichum, on southern blogs like Pam’s Digging. I know the Huntington has lost mature oaks to excess irrigation, but this moisture-loving tree must be having no difficulty with the irrigation required for the lawn and nearby rose garden. Without finding a name, I would never have learned that another Taxodium mucronatum, the legendary Cypress-of-Tule known as ‘El Gigante,’ grows in the churchyard of Santa Maria del Tule in the village of Tule, Oaxaca, Mexico, and is estimated to be between 1,500 and 2,000 years of age, considered to be among the oldest and most massive of all living things. If anyone can verify whether the ID of this tree at the Huntington depicted in the above photo is either correct or incorrect, I’d love to hear from you. This entry was posted in garden visit, Plant Portraits and tagged Cypress-of-Tule, Huntington Botanical Garden, Mexico, Montezuma cypress, Oaxaca, Santa Maria del Tule, Taxodium mucronatum, Who Framed Roger Rabbit. Bookmark the permalink. Seems to me there’s a tag nailed to the trunk of that puppy, about 1″x2″. Don’t know how you could have missed it on a trunk of that size, 😉 I could be wrong though. Rumor has it that if the plant tag has a number but no name, you can google Huntingon tag plus the number and get the name of the plant. I’ve not tried that myself, read it on a cactus forum. 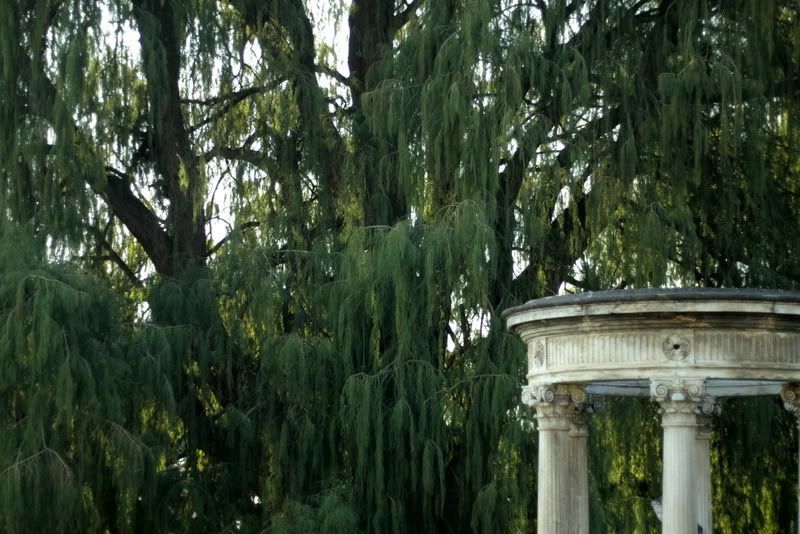 There’s another weeping conifer down by the Huntington’s lily pond that sends my heart ‘a beating too, because of course it’s blue as well as weeping–Kashmere cypress, maybe? Yet another utterly irrelevant comment: for $7,824, they should at least repaint that poor temple. It looks decidedly unloved. Thanks for the link. You are right that a broad, spreading tree has a magical quality that makes people fall in love with it. Unlike bald cypress, Montezuma cypress isn’t native to the Austin area (though it is native to other parts of Texas). However, it does grow well here. Now and then I’ll see one around town, and it makes one long to stand among its drooping, feathery branches. Hoov, we looked on the trunk but didn’t see it. Sounds like this cypress was no mystery to you! Pam, I know it was your blog and maybe Les’ that have mentioned the bald cypresses lately, and I assumed they’d need almost standing water to grow, but apparently not this relative. Actually the bald cypress is fairly drought tolerant in Austin, although it does like wet feet as well. Bald cypress in drier locations will sometimes turn rusty and defoliate in summer drought, but it recovers with rain. It’s pretty adaptable. Beautiful tree! I love the weeping habit to the branches. For the Huntingtons and Baldwins the idea of having wonderfully weird plants was also a sign of status, and growing plants might express a need to be seen as successful as much as having a sense of curiosity about plants. Unfortunately I don’t see plants occupying the same cultural niches, either that of status or of an expression of interest in things of the world, and I worry about whether there’ll be a next generation of people planting the interesting plants to populate the botanical gardens of the future. ilive in columbia ky zone 6 i think and i pretty sure i have had a montezuma cypress for about 10 years and it is beautiful. our winters are 0 or below and the tree is thriving. i believe it will survive in colder zones than 8 as seem to listed most places for this tree. I would like to try a few more (live in the country on 40 acres) to see if they will survive. Need to know a source to buy them. Looking to buy a montezuma ball cypress tree. Who sells them nearest lousiana.